Oregon Beachcomber Blog - What's washing up? : Duck and Cover- The Great Shakeout! 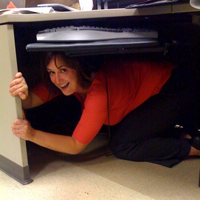 Duck and Cover- The Great Shakeout! Tomorrow, October 17, you may be slightly confused when your coworkers climb under their desks at approximately 10:17am. No, it's not because Congress is in the process of actually making a decision- it's the Great Shakeout! The Great Shakeout is designed to help people prepare for the possibility of an earthquake- and ensuing natural disaster in their area. Both individuals and organizations can sign up for the Shakeout- and if you live in a tsunami-prone area, there will likely be a tsunami drill; like that at my workplace- the Hatfield Marine Science Center, Newport OR. If you or your organization wants to participate, you can still register at the Shakeout's webpage- there is probably one in your area! Additionally, your organization or community may have further information as to a tsunami drill, and what you should do. You can never be too prepared in the case of a natural disaster- check out my Tsunami and Disaster Preparedness page for more information and links for disaster preparedness. Practicing in the best-case scenario can prepare you for the worst.